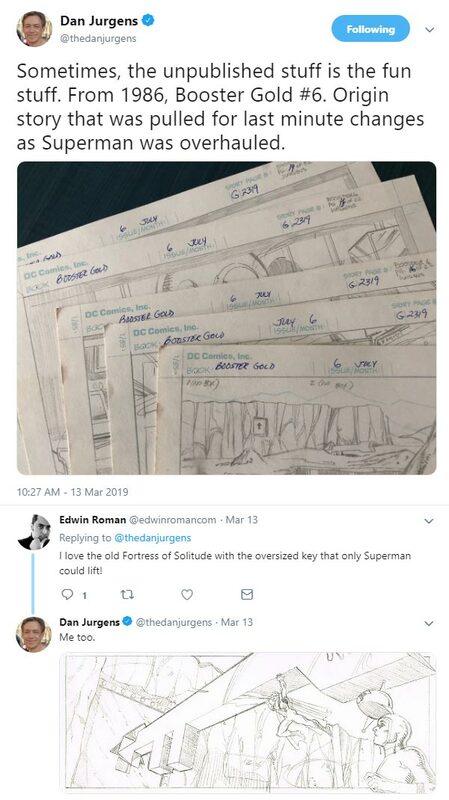 Let's make a whole week out of Dan Jurgens' Twitter feed! 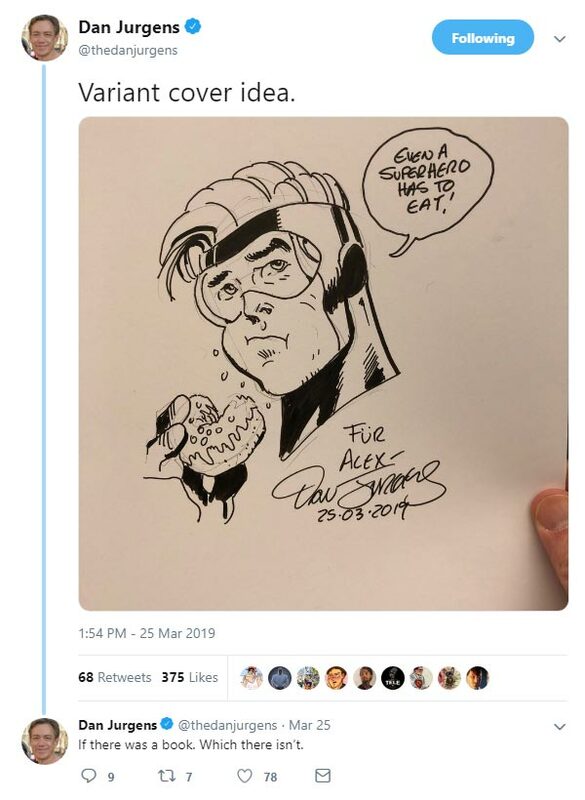 I wouldn't normally do that, but Dan has shared some pretty good Booster Gold-related stuff lately, like this tease of the original, unused art from Booster Gold #6 (1986). And before we sign off for the weekend, here's one more tweet from Jurgens, a Booster Gold sketch commission. See? Twitter *is* useful for more than just rants and bullying. Thanks, Dan! If you had two Booster Gold autographs and Booster gave you three more, how many autographs do you have? If there were four villains, and Booster Gold defeated two of them, how many villains remain? I'm on record as saying I'm no fan of what Tom King has done to Booster Gold in issues of Batman and Heroes in Crisis. However, I cannot deny that my dissatisfaction has been softened considerably by some pretty fine art by King's collaborators. 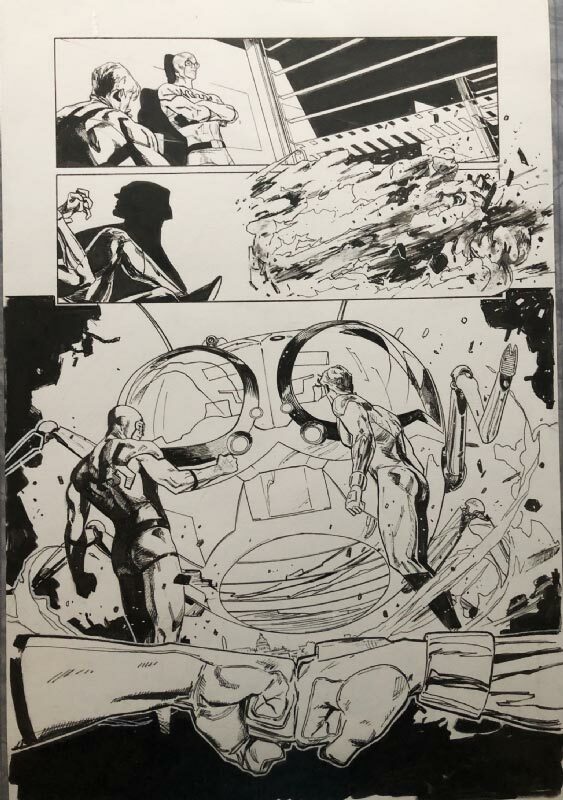 Artist Tony Daniel is selling his original inks from Batman #45 on ComicArtFans.com. I'm not nuts about the story, but doesn't Daniel's Booster Gold look dashing as he crashes through that window? It can be yours for $700! Also on ComicArtFans.com is the single greatest page in Heroes in Crisis #4. This Clay Mann piece isn't for sale, but it is definitely Boosterrific. "Bros before heroes" forever! If you owned five Booster Gold comics and then bought ten more, how many total comics do you have? If you had ten dollars and then spent four dollars on Booster Gold comics, how many dollars do you have left? 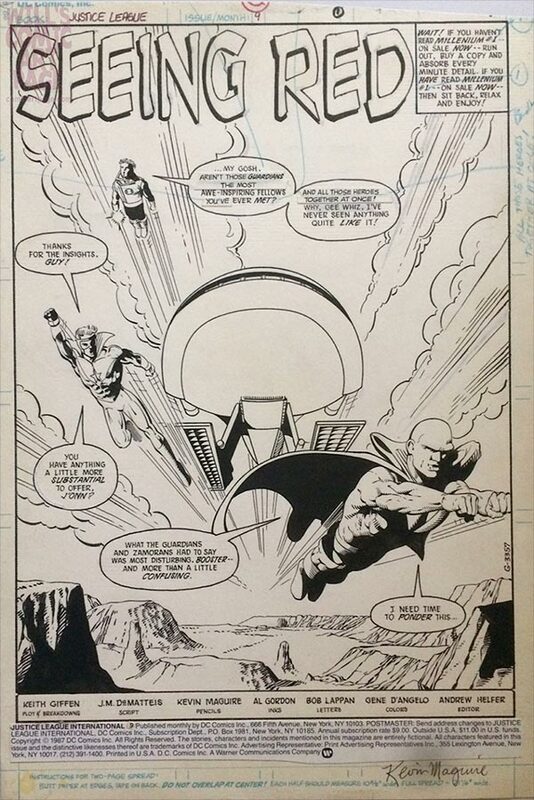 Earlier this week, the original art for the splash page of Justice League International #9 (1987) went up for sale. 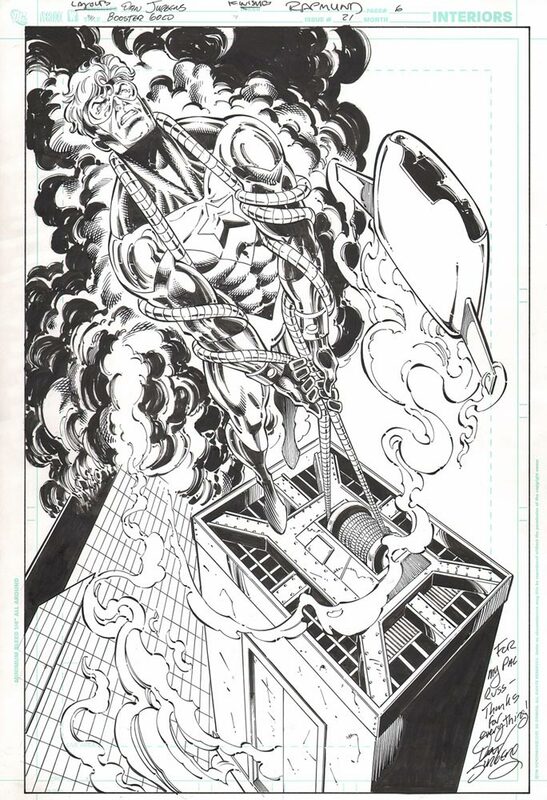 It's free to look, but if you want to own this beauty by Kevin Maguire and Al Gordon, you'll need $4,500! If you've got the cash, you'll find a "Buy It Now" button on ComicArtFans.com. If you had seven Booster Gold autographs and Booster gave you nine more, how many autographs do you have? If Booster Gold travleled forward in time nine years and then traveled back six years, how many years forward is he now? If you were buying DC Comics in the mid-90s, you might remember the company's trend of having a single story conceit linking all their summer annuals. In 1996, the theme was "Legends of the Dead Earth," a series of Elseworlds-style imaginary stories considering how DC's heroes might live on in the far future. Most of these stories featured legacy heroes, but Justice League America Annual #10 took a different tack. While its story, "The Alliance" by Christopher Priest, did take place in the far future, its central hero and villains were all active Justice League members of the time. 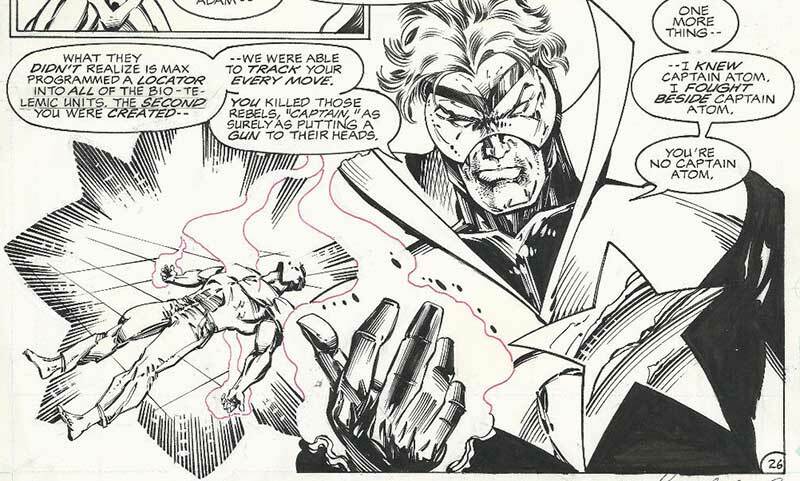 Max Lord, Captain Atom, and, yes, Booster Gold all play central roles, as illustrated in original art from the issue that is now being sold on eBay.com for a very reasonable price. Given that the big bad is Maxwell Lord and the Justice League of the future were "volunteers" with altered DNA, this annual might have been more than a little influential in stories that would come along years later in Countdown to Infinite Crisis and Justice League 3000. It is also the first time Booster wore a costume with an asymmetrically placed star! For either of those reasons, it might not be a bad issue to own some original art from. If Booster Gold had four dollars and earned nine more, how many dollars does he have in all? If Booster Gold had ten costumes and Doomsday destroyed seven of them, how many costumes remain? Here's something we haven't seen in a long time: Booster Gold in action by Dan Jurgens and Norm Rapmund. 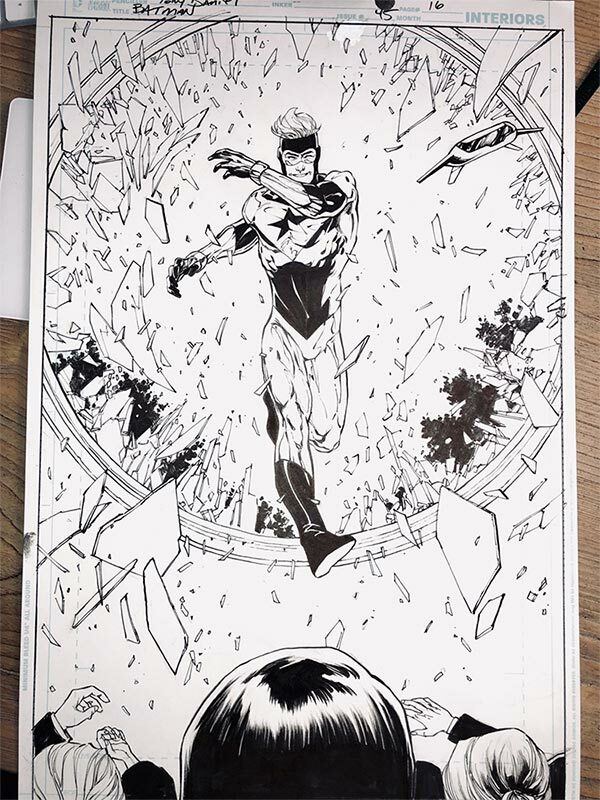 Russ Burlingame received this piece of original art — page 6 from Booster Gold, Volume 2, #21, to be specific — as a Christmas present. That's what he gets for being the hardest-working Booster Gold reporter on the Internet! Thanks for sharing, Russ.